What the Heck is Gluten and WHERE do I find it? 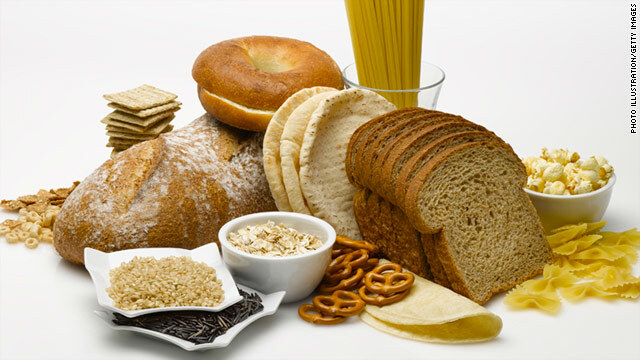 Simply put, gluten is the one of the proteins found in certain grains like wheat, barley, rye, durum, spelt, farro, graham, kamut, and semolina. It is the “glue” (get it? GLUEten, lol) that makes dough stretchy, makes it rise and adds that texture that is often enjoyed in regular bread. It is used as a thickener and stabilizing agent – Asian sauces, BBQ sauce, canned baked beans, canned chili, canned soup, gravy, ice cream, ketchup, mustard, pie fillings, puddings, salad dressings, sherbet, soy sauces, soup etc…. Here are a few more things to think about: body wash, body lotion, hair care products, make up, laundry detergent, lipstick, prescription medications, tea bags, toothpaste and vitamin supplements. How about this: your toaster, wooden cutting board, lickable envelopes or stamps, the inside of latex or rubber gloves, paint, clay, play dough and glue! WHY why why is it in everything? Simple answer for most – because it is cheap. Think about this……….what is the best way to stretch a pot of chili? Add beans. What is the best way for manufacturers to use less of the quality ingredient and make more product (and more money)? Add gluten, because is cheap. Moral of this story – READ ALL LABELS! It was my goal to make an impact so that you can see that gluten can be found in the obvious places and not so obvious places. If you want to feel better you will need to remove gluten completely and to do this you need to investigate anything and everything that you put IN or ON your body. Do not be overwhelmed by this large (but partial) listing. Once you start reading every label, it will quickly become second nature to you to be able to figure out what you can and can’t have. Don’t despair – there are gluten-free products available for most items listed above! The biggest and most important tip I can give you is to read, read, read every label – EVERY TIME YOU BUY IT (manufacturers often change their formulas with no warning or indication). If you can’t tell from the label, contact the manufacturer, toll-free numbers are readily available on the internet. If after all of this you still are not sure………don’t! NOTES: You will notice that I did not include OATS in this listing. It is not an oversight – there seems to be some question as to IF it has gluten. Naturally they do not and even though it is a different protein than wheat, some Celiacs might have a problem with oats. One of the biggest concerns is from possible cross-contamination in the growing and processing of oats – they might be grown in fields next to wheat and barley and/or processed in the same facilities. It is suggested that if you want to try oatmeal that you find a product that is grown in gluten-free fields and processed in gluten-free processing plants. Bob’s Red Mill is one of these companies that make gluten-free oats, there are others – check online. Something else to think about: Doctors say that Celiac and gluten-intolerance is from ingested gluten – but there are so many people out there (myself included) who have problems using products with gluten on their skin, hair etc. you may want to make your own choice based on your level of sensitivity. Personally I steer away from anything that has it! * When checking your labels, they will not list “gluten” as an ingredient. You will need to learn what names to look for that have gluten. I will be posting additional blogs on what to look for on a label. For now a quick tip, after the ingredients you might see a bolded line that says “Allergen Information” or “Contains”. This will be followed by a list of potential allergens. If you see WHEAT then you know for sure to stay away! Fantastic blog posting, and blog. Bob’s Red mill offersd an oatmeal product that is labelled ‘Gluten Free’, and another that is for baking, but rolled less coarsley than the glutenless. Can I assume that the baking sort is also gluten free? Bob’s Red Mill has products that are not gluten free also – SO if that oatmeal package for baking does not say that is gluten free it is not. Idea – you can always take their gluten free oatmeal and give it a spin in a food processor or blender for a second or two to change the consistency! That is what I would try.